With GoPPa lawn aerator shoes just simply walk normally!!! With the new type of best metal bucklethat will hold your foot tight and comfortable and one extra buckle to hold the strap from letting lose you will feel perfect. Non-plastic, flexible soleand the 26 nails, 2 inch long will do the perfect job for you lawn. Now you won't have to carry a heavy toolaround your yard to aerate just walk with medium size steps. No Assembly Required! Save your valuable time! - GoPPa lawn aerators come completely pre-assembled! Recommended for average size lawns. 4 steps to a perfect lawn user manual and instruction sheet. 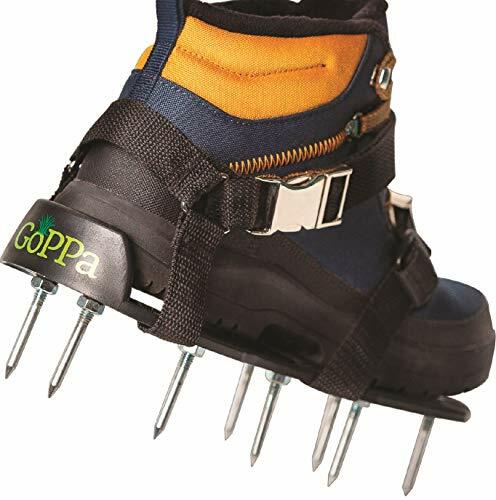 ✔️High-end LAWN AERATOR SHOES - GoPPa Comfort secret is the unique and innovative buckles strap system you FIT ONLY ONCE on your gardening shoes. ✔️EASIEST to FIT lawn aerator shoes in the world - with the comfort lawn sandal design you need to fit & close only 2 buckles. Fallow the related video & user manual to aerate your yard as a pro. ✔️FUN & EASY TO USE - With the proper adjustment, this ONE SIZE FITS ALL aerators can be used even if you're 6.5+ shoe. Fit the straps following the "HOW TO USE VIDEO" and the "USER MANUAL"
If you have any questions about this product by GoPPa, contact us by completing and submitting the form below. If you are looking for a specif part number, please include it with your message. © 2019 - buyonlineguru.com. All Rights Reserved.